Many middle school performers are uncomfortable taking the stage by themselves. Who can blame them? Acting solo can be very intimidating! That’s why these ten-minute plays are perfect for younger actors... and they’re royalty-free! 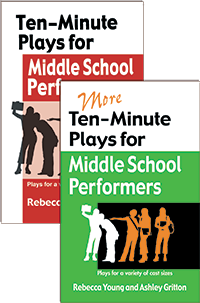 Ranging from duos to groups of up to seven, the 18 plays in each book offer short, age-appropriate material and themes that reflect the interests and issues of teens today. With a wide variety of material to choose from, some will make you laugh, others will make you cry, and some will do both! Don’t worry about inappropriate language — these books were written with teachers and students in mind! Read more...These plays all stand alone and many parts are gender flexible, so whether you’re just doing a staged reading without props or costumes or staging a complete production, you can make any of these plays work for you! A sequel collection of eighteen plays that give teenage performers the chance to reveal the unique identities and motivations of students their own age. These brief plays may be used for speech and drama classrooms, forensic competitions, or variety shows. They are easily staged with no sets or costumes. Topics include: the never-ending gossip cycle, parents, being conceited, getting in trouble, and more. Included are scripts for girls only, scripts for boys only, and scripts for mixed casts. The dialogue is believable and easy to perform. Sample titles: Word Gets Around, The School Talent Show, The Party, Three Boys and a Baby, Bad Hair Day, First Kiss, The Bigheaded Girl, and more. Save even more when you buy both books for $27.00! There’s so much more to drama class than just teaching students how to act!